Who's Getting the Biggest Slice of the Pie? In today’s world, finding the balance between work, life, play and the other pieces of your pie are getting more and more difficult to balance as the lines are easily blurred by technology interruptions, multitasking, and overscheduling. There is crossover potential in every area of our lives but we have to learn to be diligent in drawing the lines to be more productive in our intended focus. So how do we do this? We can start with a few simple steps to help outline a daily productivity plan. 1. Determine how many slices are in your pie? You will first need to determine what life categories are important to you now. Then you will need to determine how much time you will need to allot for them each day, so you can work further to figure out your weekly schedule. Let’s do the math: There are 24hrs/day and 7 days/week. 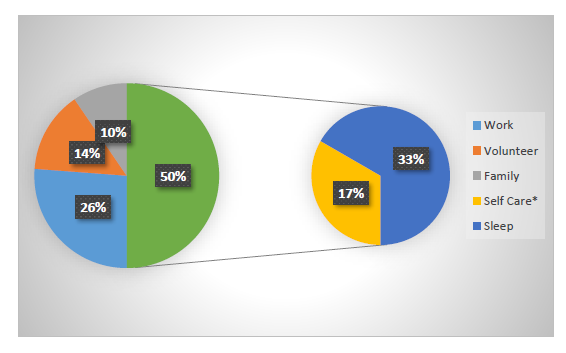 So using a simple table can help you to create your own pie chart. What’s important to you to live your life to the fullest at this time? Re-evaluate this every year. Don’t get stuck trying to live the same way year after year as your life and priorities will change. 2. Next, breakdown your daily plan so you can schedule it properly and set boundaries. Based on the Monday schedule above, you will take the 16 hours scheduled for work, volunteer and self-care and schedule out the day to define boundaries. This can be broken out into whatever increments you deem necessary but if you are scheduling down to 15 minute increments, you will want to make sure you are not overscheduling yourself by not allowing for the unexpected to interrupt your day. Life happens and it helps to pad a little buffer room in your day. You may have read the data based statistics on multi-tasking being non-productive and actually hindering your productivity, but there are ways to be creative with your idle time, using multi-tasking to your benefit. For example, if you know you will be sitting in a waiting room or stuck in traffic, you can listen to informative/educational podcasts that would otherwise interrupt your day when focused on other tasks. You can plan out appointments, make calls, make a grocery list, plan an effective route to maximize running errands, or anything that simply takes a few minutes to do that will help you check off small tasks from your to-do lists. Volunteers are the lifeline to many organizations and non-profits but it is also important for an individual to ensure they are spending their time productively while finding the right balance. Some volunteer questions to consider: what results are being produced from your work? Who is it benefitting? Is it aligning with your own goals for personal growth? Do you feel purpose and meaning from the work you are doing? Even some of the smallest tasks align to the bigger picture, so consider it all when evaluating.